On this day in 1979, a fisherman named Ken Fraser caught a record-breaking Atlantic bluefin tuna (Thunnus thynnus) while fishing in Aulds Cove, Nova Scotia, Canada, an area famous for its huge fish. It only took Fraser 45 minutes to land the massive 679 kilograms (1,496 lb) Atlantic bluefin, the largest of its species ever recorded under International Game Fish Association rules. Although over 30 years have since elapsed, the record has never been broken. Fraser’s catch was not only the biggest bluefin tuna ever caught, it is among one of the largest fish ever caught. In August 1953, in Cabo Blanco, Peru, Alfred Glassell caught a 707 kg (1560 lb) black marlin (Makaira indica). On 7 May 1953, Lou Marron landed the world record Swordfish (Xiphias gladius) in the open ocean off the coast of Iquique, Chile; it weighed in at 536.15 kg (1,182 lb). In 1959, off the coast of Ceduna, South Australia, Alfred Dean caught a great white shark (Carcharodon carcharias) weighing 1208 kg (2664 lb), the largest fish ever caught on rod and reel. The Atlantic bluefin tuna–also known as the Northern bluefin tuna, the giant bluefin tuna and the tunny–is one of the world’s fastest fish. Equipped with a streamlined, torpedo-shaped body, they can reach speeds up to 70 km/h (43mph), average 2–2.5 metres (6 ft 7 in–8 ft 2 in) in length, and weigh 350 kg (770 lb) as adults. Voracious carnivores that feed on fish, squid, and crustaceans, they can dive to depths of 1,000 metres to reach their food. They are warm-blooded, a rare trait among fish, and can thermoregulate to keep their body temperatures higher while in colder waters. Highly migratory, they travel thousands of miles across oceans. They can be found in the Western and Eastern Atlantic and the Mediterranean, but are sadly extinct in the Black Sea and the Caspian Sea. Throughout history, they have been a popular and highly sought-after fish, a valuable commercial catch from the classical era of the Ancient Greeks and Phoenicians to the current day. Nowadays the market is more lucrative than ever, mainly driven by Japan’s desire for the finest sushi and sashimi, and so the species has been driven to near extinction due to overfishing. 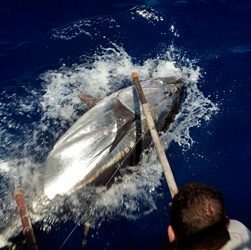 A 2009 report by the International Commission for the Conservation of Atlantic Tunas confirmed that Atlantic Bluefin Tuna stocks have plummeted by 72 percent in the Eastern Atlantic and 82 percent in the Western Atlantic within just 40 years. Despite these numbers, shifty politics have prevented any meaningful protection for the species. And with all manner of fish stocks dwindling, and even facing extinction, it seems quite likely that Ken Fraser’s record-breaking catch will never be bettered. Caption: The bluefin tuna is one of the world’s fastest fish.